The history of Lacanche is quite inspiring. The story starts our normally enough. In the factories of Lacanche, a tiny village in the hills above Beaune, a high-performance and timeless-aesthetic approach to stoves was adopted. In this very same place, the now famous stoves bearing the village’s name are designed. The actual site of the factory dates all the way back to an 18th century Burgundian gentleman who went by the name of Richard de Curtil. It was Curtil who decided to put the iron contained in his subsoil to good use. To this end, he created an iron foundry at Lacanche. A man named Jacques-Etienne Caumartin later took control of the ironworks in 1796, and the company remained in the hands of the Coste-Caumartin family until 1972. At first, the Lacanche Ironworks factory was dedicated to manufacturing stoves for high end estates and professionals. Then, with the acquisition of the site by a corporate subsidiary of the Valéo Company a great period of diversification began in the 1970s. All seemed well until Valéo withdrew from the factory in 1981. Suddenly the 228 workers found themselves without an employer. This would have been the end of most factories, but for Lacanche it was only the beginning. Lacanche fought against all the odds. In the end, the stoves of Lacanche were to take on a new life of their own, all thanks to André Augagneur. André Augagneur had worked in the company in the days when the Coste­-Caumartin family owned it. One day he decided to launch an industrial project. A project that was meant to save the site and 40 jobs. At first, the factory concentrated on sub-contracted work. However word of its activity soon spread abroad and the demand for professional stoves was soon on the rise again. With the return to traditional values and the increasing interest shown by members of the general public, Success was all but guaranteed. André Augagneur once said “we have created a new generation of top-of-the-range stoves, combining the aesthetic appeal of the old Lacanche stove with the technological prowess of modern professional appliances”. Thus the Lacanche stoves were born! Now they can be seen gracing the pages of countless home decoration magazines. The company also employs over 200 persons again, giving much needed jobs to the people. Now that you know a little about the company, it’s time to get to their products. I can think of no better place to start than Lacanche’s brilliant Ranges. These ranges come in 5Feux, 6-8Feux, and even 9+Feux designs. These designs are not only gorgeous, but they come in a mind boggling number of colors. The colors ranging from black traditional blacks, whites, and stainless steel to bold colors like orange, greens, red, pink, and more. You can also the color of the trim! All of the Lacanche cook tops are Easy to use and clean, but that’s only the tip of the iceberg. The Classique Burner: This burner is an 18,000 BTU open burner that provides the quickest and most efficient heat transfer for large pots and woks. A real power house of a burner, this is perfect for bringing large quantities of water to a boil quickly for stocks, canning and pressure cooking as well as stir frying, searing and the like. 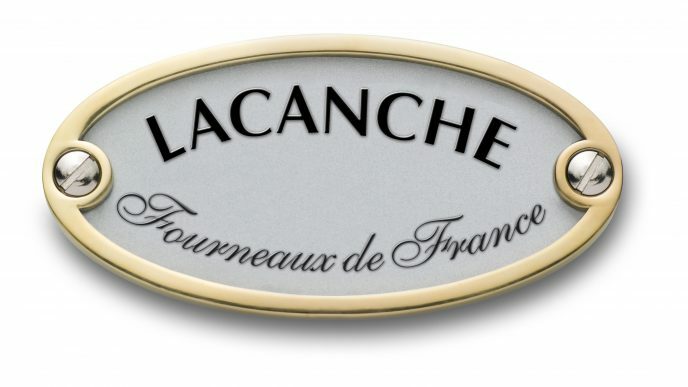 Lacanche French Top Traditional Plate: This bad boy is also at 18,000 BTU. These cast iron “Trad Plate” offer a controlled-heat surface that can make the perfect simmer for even the most delicate sauces. Heat that would usually concentrate in the center of the plate radiates outwardly from the heat source. This allows the use of the entire surface area of the plate for multiple pans. 15,000 BTU Burners: When you need to add a pair of burners to your cook-top and want a little bit more of a kick than a pair of 11,000 BTU burners an offer, the 15,000 BTU is highly recommended. You can bring pots of water to a boil in mere minutes or Sauté with the ease of a highly trained chef. 11,000 BTU burners: This is your standard burner option. It’s the perfect way to make sure your cook-top is as versatile as possible. Keep in mind that smaller burners allow correspondingly lower heat output. Plancha: The Plancha is a high-heat griddle option made of chrome-plated steel. It’s comparable to teppenyaki grills in Japanese restaurants. The unique design and high-heat features are ideal for searing vegetables, as well as meat and seafood. Using the Plancha is an easy way to add healthy meals to your family’s diet. Flame Grill: If you love to grill, the flame grill is an easy way to bring your outdoor grill inside. Lacanche grills use controlled heat without allowing food juices to drip onto the heating elements. This results in a much healthier style of cooking. Using radiant heat means meats, fish, or seafood will better retain their flavors as well. In addition to their lovely ranges and wide variety of cook tops, Lacanche offers three oven types: Electric, Electric Fan Convection, and Gas. The gas ovens are available in propane or natural gas. With gas ovens, gas combustion releases naturally convected air and water vapor. This hot, moist air is what really helps gas ovens produce delicious blended flavors. Electric ovens, on the other hand, produce a dry heat. This is ideal for sealing in flavors. As you can see, both options have pros and cons. That’s why serious cooks often select a double oven range with one gas oven and one electric oven. Last, but certainly not least, Lacanche offers a wide selection of Accessories and Ceramic briquettes. As if a great range of fantastic appliances wasn’t enough, Lacanche offers a two year warranty. If your Lacanche ever require service, or if you just have questions, Art Culinaire can help. They have established a working relationship with over 200 appliance servers nationwide. Every single local server was carefully selected to provide fast, friendly, reliable service for your Lacanche range. You can trust Lacanche to treat you like a human being, not just another dollar sign. When it comes to ranges, there is no competition. Lacanche has quality, value, variety, and support. When you’re ready to buy the best range you will ever own, go to Lacanche.